PEI Department of Environment – (UPDATED) regulations regarding septic licensing | Engineering Technologies Canada Ltd. This is our understanding of the current policies regarding the various licenses issued by the PEI Dept. of Environment related to on-site sewage disposal. In summary, the Department issues site assesors licenses ($250), septic contractors licenses ($250) and septic installers licenses ($25). 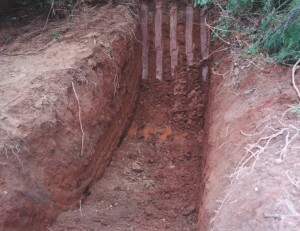 The septic contractors license ($250) is generally issued to the owner of a company. Only the contractor can select a system from the guideline document. He can not design a system. Only Engineers can design a system. To obtain a contractors license you must have a site assessors license (see below) and a pass mark on the Department’s contractor’s license exam. License is good for 2 years and is to be renewed on April 1 of the year it is due. It is also required to attend a meeting/seminar at least once in the two year period. An installers license ($25) is issued to an employee of the company (someone who has the knowledge of how to install a system but has not written an exam). Essentially he/she is just an employee of the company and is registered with the Department as an installer. He must also attend one of the PEI Department of Environment’s seminar/meetings once every two years to be qualified. License is good for 2 years and is to be renewed on April 1 of the year it is due. New applicants for a site assessors license ($250) must have two years of post secondary education in a related field, and take a course on soils and site assessments that is acceptable to the Department, and pass the course exam. Pass mark is determined in consultation with the Department. The license is good for 2 years and is to be renewed on April 1 of the year it is due. UPDATE (April 25, 2013): We recently received the following updated information on the department’s requirements for a Site Assessor’s license. Section 5(3) of the new regulations states that the Minister may grant a site assessors license to an applicant without post secondary education, if the applicant has practical work experience in a related field and meets the requirements of section 5(2). A review of each applicant’s experience would be performed by the Minister on a case-by-case basis to see if they would qualify. The Department currently does not have a course in place for contractors or installers and has no plans to do any training. In the past an applicant would challenge the exam they have on file and if they passed, the department issued a license. That has changed because new contractor’s licenses will only be issued to a person already holding a site assesors license.